F.A.Q. 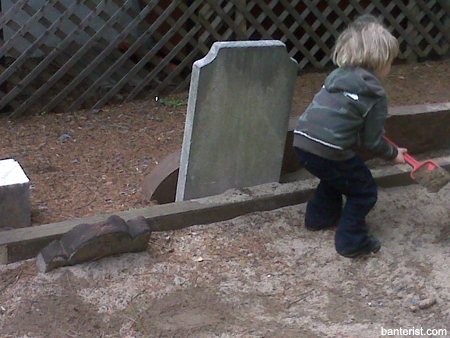 : Why Is Your Playground On Top Of A Cemetery? 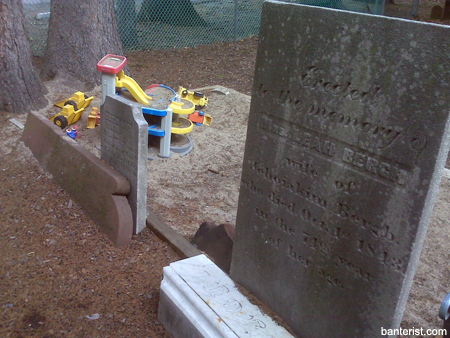 Why on earth did you put a playground on top of a cemetery? You know, we hear that a lot. And the answer will surprise you. When you’re thinking about building a playground for kids, your first inclination might be “let’s not build this on a 200-year old cemetery.” But in our case, we thought differently. 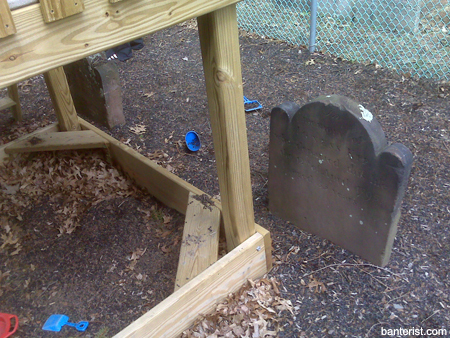 What the hell were you thinking when you decided to build a playground on top of a cemetery? Good question. When we designed our playground we knew it would have all the normal accoutrements of any children’s play space: slides, play houses, a sandbox and toys. But we wanted to offer something most playgrounds don’t offer: a chance for kids to come face-to-face with the prospect of mortality while they’re playing with sand. What thought process goes into building a children’s playground on top of a cemetery? It’s not as easy as you would think. When you’re building a playground on a normal piece of land that doesn’t have dead bodies in it you don’t have any obstacles in your way. In our case though, we were building a playground on top of a very old cemetery. 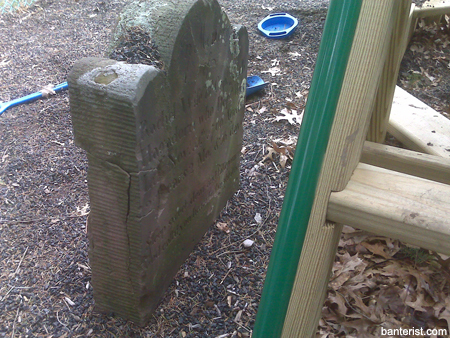 We didn’t want to remove the grave stones because we felt it was important to respect the graves we were putting a playground on top of. So we built around them. Do you realize you built a children’s playground on top of a cemetery? Oh lord yes! We have lots of people remind us of that. And there are numerous instances when people visiting Rhinebeck see the playground and decide to let the kids out of the car for a stretch. We like to watch the faces of the parents because you can see the very moment they realize that we built a playground on top of a cemetery. You can almost read their minds.